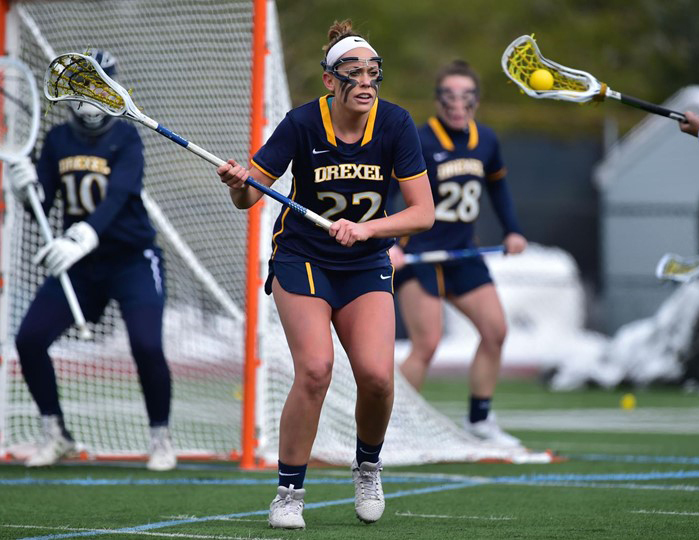 The Drexel University women’s lacrosse team has had a rough first half of their season before they enter Colonial Athletic Association conference play April 6. Their last matchup was against East Carolina University March 30. At the beginning of the game, ECU won the draw to gain possession, but sophomore Courtney Dietzel forced an ECU turnover 20 seconds into play. The Dragons got the ball to junior Cassidy Delaney, and she scored the first goal of the game. The Dragons picked up a ground ball again after another ECU turnover. This time, freshman Colleen Grady took a shot right past the ECU goalkeeper to put the Dragons up 2-0 in just the second minute of play. The Dragons were leading most of the first half until the last 13 minutes of play, when the teams consistently stayed within one goal of each other. By 1:54, the teams were tied 6-6 after a goal from ECU’s Emma Bowman. With 36 seconds left, Bowman found Nicole Legar for a goal that left the Dragons trailing by one at the end of the first half. However, this was the last goal that ECU scored against the Dragons as Drexel controlled the entire second half scoring nine goals for the win. Freshman Karson Harris scored the first goal of the second half off a free position shot that tied the score 7-7. With 21:11 to play, sophomore Lucy Schneidereith scored. Dietzel converted another free position shot for a goal about a minute and a half later to put the Dragons up 10-7. Though this was a comfortable lead to have over ECU, the Dragons didn’t stop there. By the end of the game, the Dragons took the win 15-7 against ECU. A tough first half only sparked a dominant second half for this Drexel team. The top scorer for the Dragons was Delaney with four goals and three assists. Grady and sophomore Jamie Schneidereith each had a hat trick with Grady also passing two assists. Harris finished with two goals, and Lucy Schneidereith, Dietzel and senior Alex Beilman all finished with one. The Dragons were able to outshoot ECU 25-9 in the second half. Freshman goalkeeper Zoe Bennett had nine saves to hold off shots taken by ECU. A big weekend against two top 10 ranked teams lies ahead for the Dragons as they begin CAA conference play April 6 hosting No. 10 Towson University (8-2) at 6 p.m. They will then travel to Harrisonburg, Virginia, April 8 to face No. 4 James Madison University (9-1). Last season, the Dragons went 2-4 in conference play missing out on the CAA tournament. The last time the Dragons went to the tournament was 2016 where they lost in the first round to JMU. Students can come out and support the women’s lacrosse team as they attempt to make it to the tournament once again!